I has decided to starts providing a new community service to dispose of all ther unwanted tuna. Even though we are in the dog days of summer, the colder weather is right around the corner. 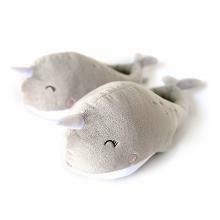 Keep your feet warm this fall and winter with these awesome Narwhal USB Heated Plush Slippers. Hai! Mai name is Bubba. I'm justs a good ol' dog tryin' to beats the summer heat! Have a little boy that loves animals and needs a great way to carry his lunch or snacks? I was looking for my kid since he is now a big boy and needs to take lunch. What Do You Know About Calico? Calico cats are known for their coat of three or more colors, but many people don't realize that this is not a breed of cat. The Truth About Dog Lovers -- On A Mug! Dog lovers do love their dogs a lot, but this Dog Hair Mug does seem to take it too far in a fun way. Well, you justs said "push!" You didn't says which way! Been bitten by the love bug lately? Longing for the sweet sting of Cupid's tiny arrow? Then look no further, ladybugs and harvestmen, as we present some of Mother Gnature's cutest crawly critters.